This painting was commissioned in 2004. I was so happy with the Space Theme painting that I asked John Higy to paint a 2nd one for my dining room, and let John choose the theme. He said he'd never done a Southwestern theme. Here is the result. 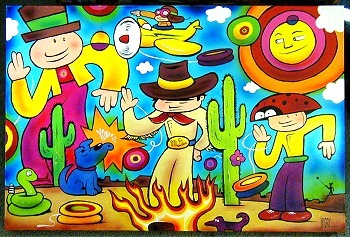 Again, "yoyodave" is displayed in the painting, on the cowboy's belt buckle. Commissioned in early 2004 by David Hall, "The Yo-Yo Collector", and owner of Skilltoys.com.